What looks like lumpy potatoes or clods of dirt are actually a fungus more precious than gold to gastronomes. 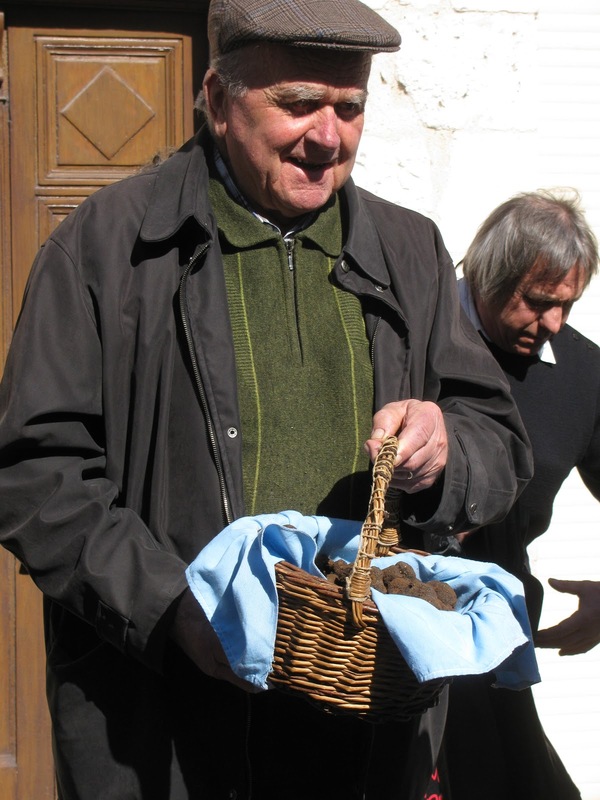 Every Tuesday afternoon from the first of December to mid-March, people from all over France converge on Lalbenque, the largest truffle producing area in the country, to buy truffles. Laury and I were among them today. I've been wanting to see the market all winter, but between my bad knee and the icy cold weather, today was the first time it really seemed feasible to make the 40 kilometer drive. 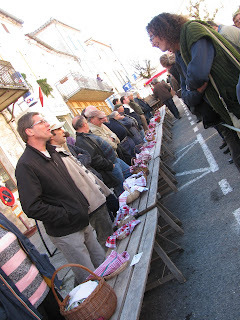 It was a perfect afternoon for truffle and people-watching in Lalbenque...warm enough to sit outside and have a biere pression and share a plate of frites while we waited for the bell that signalled the beginning of the market. We watched the buyers and sellers eye each other across the ropes stretched to keep them apart until it was time to negotiate. We intentionally arrived early so we could take photos and relax a bit before the action began. According to what I'd read about the market, the buying/selling only lasts a short time. If you're late for the opening bell, you miss out. It was fascinating to watch the crowd gather. You could tell just from observing the buyers that many were not local. The sellers lined up basket-to-basket the length of long, narrow tables. The buyers piled up several people deep against the restraining rope. At the bell, rung precisely at 2:30pm, the rope dropped and the sniffing, pinching, scraping, and negotiating began. As I understand the process from reading the internet, buyers must make an offer of a price per kilo (even if they only want a much smaller amount). The seller then says yes or no. I guess half the fun is negotiating an agreeable price. 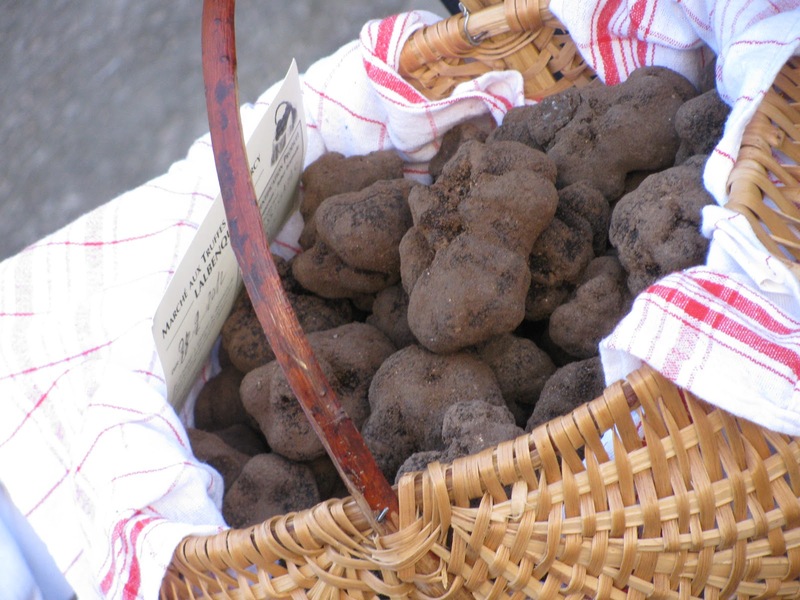 At prices that can go as high as !000 euros per kilo, buying truffles is not for the faint-of-heart! I watched a man and his family buy a little bag of 3 small truffles and hand 70 euros to the seller. By 3pm most of the truffles had disappeared, but most of my questions had not. I'm intrigued with the entire process. I want to know more about truffles and how people use. them It appeared that those truffles that weren't bought went home with the sellers...how long do they last? do they bring the same ones back next week if they don't get a price they are happy with? how do you buy just one? could I afford one? I definitely want to make another trip and try my hand at truffle-buying, but it will have to wait until next year, I'm afraid. This year's season is almost over. There will be more photos from the truffle market, so be sure to check back! Lalbenque is the big one in the region but there's also a smaller one at Limogne every Friday morning at 10.00. I thought I'd try to get there this Friday having arrived half an hour too late one Friday last year. Look forward to seeing your additional photos.